Seen better tag lines in spam? 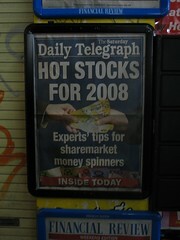 Walking past a newsagent last night I saw this ad for the Saturday Daily Telegraph. I’m sure I’ve seen these phrases somewhere before. Probably in investment advice spam email. Am I being too cynical, or is it just crap copy? This entry was posted in Photos and tagged investment, newpaper, newsagent, spam. Bookmark the permalink.